If you’re not familiar with teasel, it is distinctive due to its coarsely spined flower heads, pictured above. The plants are herbaceous biennials. During the first year of growth, a leaf rosette is formed. 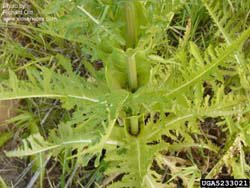 In the second year, a tall (3-8 feet), prickly stem forms. It branches at the top and forms egg-shaped flower heads. Tiny flowers emerge first in a band around the center of the flower head and develop both up and down from there. The prickly dried flower heads can be used as a comb and were widely used in the plants native range for combing, cleaning and raising the nap of fabrics, especially woolens (sample device pictured below from the Trowbridge Museum website). The root system has a substantial yellow tap root with fibrous secondary roots. Seeds are attractive to birds and wildlife. Where teasel is native (Europe, Eurasia and northern Africa), it is recommended for gardens both as an ornamental and as an attractant for birds (ie the European goldfinch) and wildlife. The dried flower heads are sometimes used in the floriculture trade. A fascinating attribute of teasel is that the plants are considered partially carnivorous. Carnivorous plants are those that are able to trap insects or other tiny animals and digest them or extract nutrients from them to use as a source of sustenance. 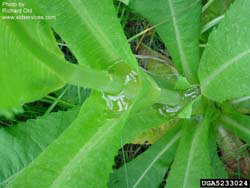 In the case of teasel, the leaves on the stem formed in the second season are fused where two opposite leaves meet on the stem. This forms a small ‘cup’ where rain water collects and tiny insects are caught there. In a study done in the UK by Peter Shaw and Kyle Shackleton and published in 2011, it was shown that common teasel plants with dead fly larvae placed in the water in the ‘cup’ had a 30% greater seed set and seed biomass than plants with no larvae. While the larvae did improve seed production, they did not see an increase in overall plant growth/biomass. To distinguish between common and cut-leaved teasel, both the leaves and flower heads can be used. See the images below for comparison. Common teasel leaves and flower heads. Cut-leaved teasel leaves and flower heads. 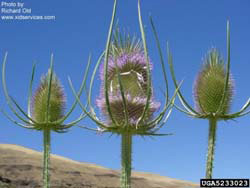 The first report of common teasel in the U.S. was dates back to the 1700s but no additional reports are known until the 1800s when it was described in Oregon, Michigan, New York and Niagara Falls, Ontario. Since that time, it has spread and been confirmed throughout the contiguous states except in the northern great plains and the southeast. 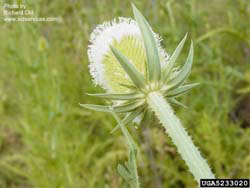 Cut-leaved teasel was reported from Michigan and New York prior to 1900. Both species are considered invasive in the U.S. but without a legal status. While described as being ‘invasive’, states don’t necessarily have a legal status limiting the distribution of these plants. Connecticut does not. Besides using the dried flower heads, root extract has historically been used to treat a variety of ailments including stomach upset, pain, inflammation, nervous system maladies, and most notably, and more recently, in the treatment of Lyme disease. It is reputed to draw the bacterial pathogen causing Lyme disease out of tissues where it is protected from antibiotics into the blood stream where it is susceptible to them and to the body’s immune system. This is NOT a recommendation to use teasel in the treatment of Lyme disease in the absence of treatment by a medical professional.